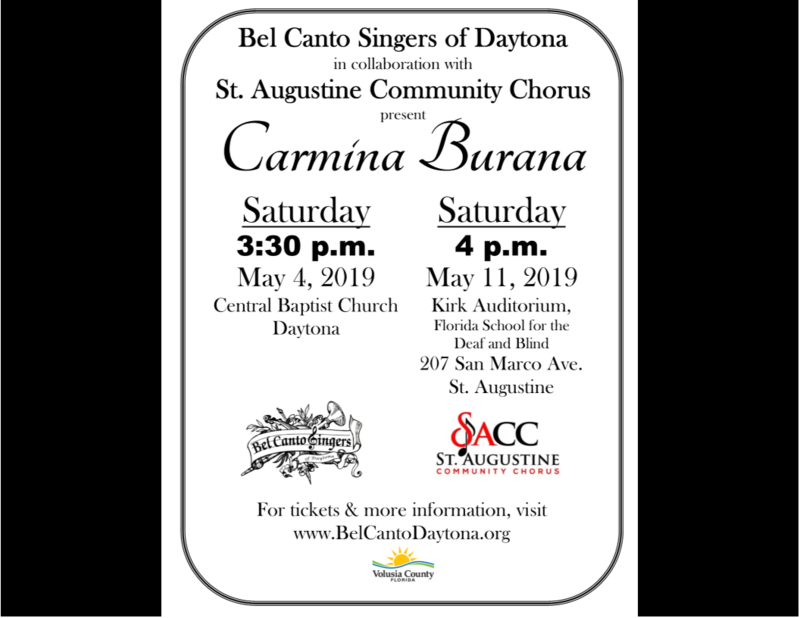 “Bel Canto” is Italian for “beautiful singing.” Beautiful singing is the desire of every member in Bel Canto Singers of Daytona. Established in 1971, the Daytona Beach, Florida based singing group performs three to four classical and semi-classical music concerts yearly. From September to May, Bel Canto may be heard throughout the area performing in churches, auditoriums, university halls and performing art centers. The group also performs in collaborative efforts with international, national and local directors and with other artists and chorales. Presenting works of the masters is a priority with Bel Canto Singers of Daytona. Handel’s Messiah, Brahms’s German Requiem, Mozart’s Requiem and Vivaldi’s Gloria are among their favorite performances. However, they are just as comfortable offering concerts with such diversity as Carmina Burana, Frostiana or Porgy and Bess. The group also routinely performs concerts of spirituals, hymns and their ever-popular tunes from Broadway. Occasionally, Bel Canto shares the stage with other musicians such as the London Symphony Orchestra, Florida Symphony Orchestra, Jacksonville Symphony Orchestra, Stetson University Symphony Orchestra, Daytona State Community Orchestra, and Solisti Chamber Orchestra. They have also conducted two international tours. All concerts begin at 3:30p.m. Programs funded in part through support from the Cultural Council of Volusia County. Powered by w3.css, harnessed by Linné.